Aluminum honeycomb core provides the highest rigidity while remaining the lightest of any substrate available. Aluminum honeycomb cores are impervious to extreme temperatures and can withstand temperatures ranging from below zero up to 350 fahrenheit. Made with Aluminum Honeycomb and a wide variety of core substrates including Polycarbonate, Polyiso Form Core, Plywood, Polypropylene and Paper cores. We offer pre/post machining, edge profiling, internal/external parts, hinges, drilling/tapping and many additional options..
Closeouts can consist of Epoxy Edge Fill, Wood Framing, C-Channels and a Press-Brake Bend. Other options available. There are many options for panel construction designs, and edge enclosures are used to improve visual appeal, while providing rigidity, support, and protection to the panel. WE BUILD OUR PANELS TO YOUR SPECIFICATIONS, CONTACT US FOR PROTOTYPING AND DESIGN DEVELOPMENT. 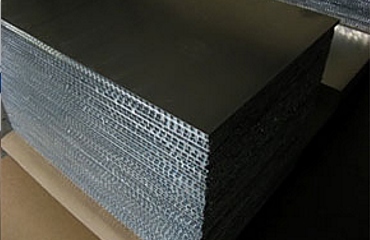 Flatiron Panel Products specializes in providing lightweight, high strength structural panels. 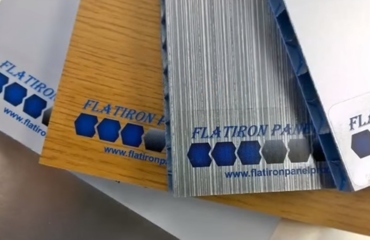 The owners of Flatiron Panel Products, David Torres and Bob Freedman, have more than 23 years of combined experience in manufacturing, machining and laminating honeycomb panels. 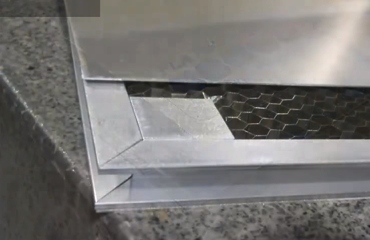 For 23 years, Bob owned Flatiron Machine and Development, Inc. where he perfected his technique for manufacturing honeycomb panels. 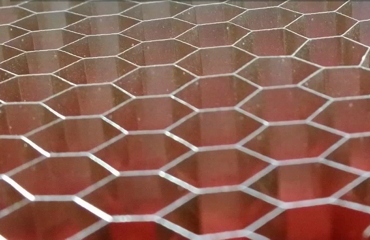 David has devised numerous new techniques that increase production and the quality of honeycomb panels during his eight years of experience. Together, they are able to provide top-quality structural panels in numerous styles, designs and materials at competitive pricing.